10Radio is the community radio station for the Ten Parishes of Ashbrittle, Bathealton, Brompton Ralph, Chipstable, Clatworthy, Fitzhead, Huish Champflower, Milverton, Stawley and Wiveliscombe in Somerset. 10Radio broadcasts 24/7 from studios in Wiveslicombe, Somerset. 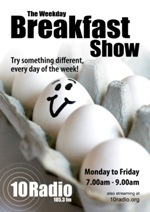 Our programmes include a live Breakfast Show every Monday to Friday 7-9am and on Saturday 8-10am. We provide a diverse range of music, comedy and talk shows weekday evenings, and great all-round entertainment at the weekends. The rest of the time you can listen to repeats of earlier shows or to our unique 'shuffle' of music. 10Radio is broadcast from the people to the people - it is entirely owned and run voluntarily by the local community. The Community Show is 10Radio's showcase every Friday morning, embracing all aspects of the communities within the ten parishes. See Community Show Page for full details of the latest programme and hit Play to listen to the recent edition of the show. Go to Listen Again for interviews from various 10Radio programmes. No matter where in the world you are you can hear and enjoy the station with a click on the loudspeaker symbol at the top of the page, this box heading or HERE to listen to 10Radio streaming round the world. You can also hear 10Radio on streaming Apps such as RadioAir, RadioGarden, SimpleRadio, TuneIn and many others. If you would like to be a part of 10Radio as a presenter, back-room assistant, receptionist or whatever please contact us on 01984 624137 or email info@10radio.org - we look forward to hearing from you soon. Click Here to hear (and see) from the Technical Team how it all works. Mindline - a friendly, anonymous and non-judgmental listening service for people feeling isolated or distressed. Also available to those concerned about a friend, relative or neighbour experiencing mental distress. 11 Years of great radio with many more to look forward to! Text formatting e.g. Bold & Line breaks will be lost. Add an email if you're hoping for a reply!